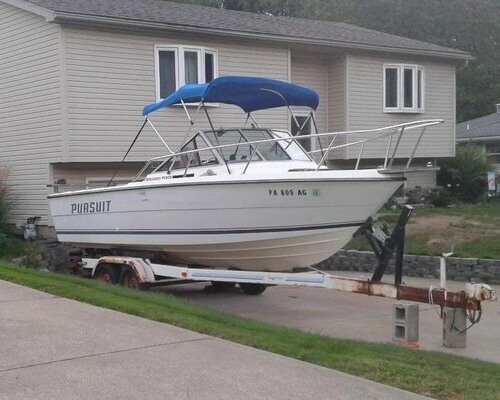 Listing this boat for a friend of a friend. He is not a computer savvy or a member but I've met him and he is straight up.He bought my friend's 26' Silverton and now is selling the Pursuit.Here is what I know. It's a 1985 Pursuit with a fiberglass inner liner on a tandem axle trailer. V6 engine with Mercruiser O/I. Hours unknown. Comes with 3 manual riggers, plane board mast, gps and fish finder. Also multiple rod holders.I don't know the specifics so please don't email me. The best way is to TEXT Roy. He doesn't answer calls because of telemarketing. He is the owner and has been for the last 18 years. Clean paperwork. The boat is located in Erie PA and can be seen there. TEXT ONLY Roy @ 814-572-4991. Additional pictures to come. What's a fiberglass inner liner? Basically a factory fiberglass shell. The floor is textured. No carpet. Maybe referring to a self draining cockpit with non-skid, which most if not all Pursuits have. It would be the 4.3 GM block with a Mercruiser outdrive. Or just text Roy as suggested. We have 1984 pursuit in the 25' flavor.... well built boats. Did not kno the self draining cockpit could also be called a glass liner. Love LOU.... always learn something! Only thing I don't like about that part of the design is that the drains are hard to access when they get clogged. Otherwise, Lots to love about tiara/pursuit! !